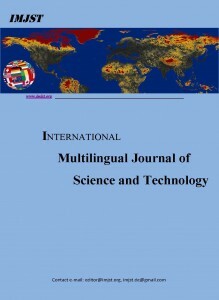 International Multilingual Journal of Science and Technology is peer-reviewed, online international journal published monthly. It publishes research papers focused on current issues from every aspect of the business and economics, humanities and the social sciences, and science and technology in various languages as per the choice of the author. The journal follows double-blind peer review process. The journal seeks original manuscripts that provide theoretically informed empirical analyses of worldwide current issues, as well as original theoretical or conceptual analyses. ISSN for IMJST Digital Library is : ISSN: 2528-9810 (Online) IMJST invites the scholars and academicians to publish the papers in their preferred languages. The IMJST has many benefits all geared toward strengthening research skills and advancing academic careers. Journal publications are a vital part of academic career advancement. IMJST– Author Benefits specific to paper publications: Easy & Rapid paper publishing process. IMJST is indexed in Google Scholar, Arxiv, ResearchGate, Scirus, getCITED and many more. We have prestigious academic journal reviewers team from world’s renowned universities. Open Access Journal Database for High visibility and promotion of your articles. “IMJST” is steered by a distinguished Board of Editors and is supported by an international review board consisting of prominent individuals representing many well-known universities, colleges, and corporations in the United States, United Kingdom, Germany, Australia, Canada, Japan, China, India and many more. To maintain a high-quality journal, manuscripts that appear in the IMJST Articles section have been subjected to a rigorous review process. This includes blind reviews by one or more members of the international editorial review board, followed by a detailed review by the IMJST editors. As provider of Open Access Journal, IMJST serves more than millions of Scholars, Academicians, Scientists, Students and information professionals worldwide. We help our authors in advance research with their native language as English, French, Chinese, Spanish, Portuguese and more in different branches like Business and Economics, Humanities and the Social Sciences, and Science and Technology etc. and in science fields by providing world-class information and innovative tools that help them make critical decisions, enhance productivity and improve outcomes.